Hi There! I hope you are having a good start to your week. I have some good news and bad news. First the bad news.... I am not done with my Christmas cards! Gasp! 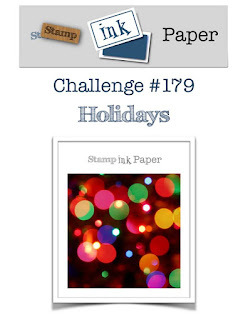 The good news is that if you are in the same boat as me, Stamp, Ink, Paper has the challenge for you! I have not felt well the last week so I opted for a super simple card using the awesome Gina K Designs Festive Foliage Stamp Set by Claire Brennan! I absolutely adore this stamp set. I used it to make several cards last year! This was super easy. I started with a top folding card base of Neenah Crest Classic Solar White cardstock in a 110# cover weight. My top layer was Bristol Smooth Cardstock that I taped off with some Purple Tape by Thermaweb. I used Tim Holtz Distress Inks in Peacock Feathers and Faded Jeans to inkblend within the open area. After removing my tape, I put the front panel in my Misti and used sponge daubers to apply the Early Espresso (SU) and Mossy Meadow (SU) Inks. Once stamped, I added a quickie glue pen over the open areas of the pine cones and added some fine sparkly glitter. I heat embossed the sentiment in Mossy Meadow on the lower left side. I thought about adding sequins but I loved the simplicity of this so I just left it as is. PCC319 One Last Christmas Card! 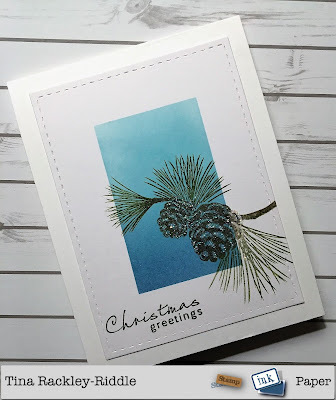 PCC317 Sketch Challenge - Christmas Card!